According to the Massachusetts Department of Transportation‘s (MassDOT) Registry of Motor Vehicles (RMV), local and state inspectors handed out more than 100 citations in nearly 200 towns and cities recently to those who passed school buses as they were dropping off or picking up students. The citations were handed out during a recent undercover program that aimed at targeting these irresponsible drivers to help reduce the risks of school bus-related pedestrian accidents in Massachusetts. This was the 7th year that the Registry practiced the “Operation Yellow Blitz” program, used to raise awareness about this dangerous driving behavior and the risks our young school bus riders face while getting on and off a school bus every day. “We want to get the word out that drivers on both sides of the road need to stop when school buses pick up or drop off children,” said Registrar Rachel Kaprielian. Our Boston car accident attorneys understand that all traffic is required to stop when a school bus is stopped for a pickup or drop off. Unfortunately, many drivers fail to do so and place our young school-aged children at a serious risk for an accident. Kaprielian reports that this is a huge concern for the RMV. The Registry has been able to recruit the participation for more than 150 cities and towns in the last 7 years. In 2007, there were only 30 areas participating in Operation Yellow Blitz. Kaprielian says that officers and officials witnessed five vehicles pass a school bus at once at one particular stop. All vehicles were pulled over. A few of these drivers said that they were unaware that they had to stop for a school bus. The truth is that all drivers have a responsibility to know when they’re traveling near a school bus and to stop their vehicle when a bus’ red lights are activated. According to MassDOT, drivers can be fined nearly $300 the first time they’re busted and $1,000 and a temporary license revocation for a second violation. The Operation Yellow Blitz program is a yearly enforcement program that is used to target bus stops and passing traffic along roadways and at intersections. Although this program only comes around once a year, bus drivers are always on the lookout for disobedient drivers every day. Bus drivers will write down your vehicle information and you license plate number and report it to the RMV if they observe you passing their stopped school bus. If you’re a repeat violator, you could potentially face an administrative hearing that could possible result in your license being suspended. Last year, MassDOT wrote more than 2,150 warning letters. This year, more than 1,600 warning letters have been issued so far. 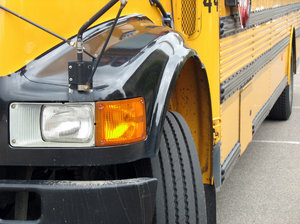 Roughly 5,000 students are injured every year in school bus-related accidents. A large number of these accidents happen as students exit or board the school bus. One main reason for this is because a school bus offers large blind spots, not only to bus drivers but to passing motorists as well. Many young bus riders don’t understand this danger and are unable to foresee potential dangers around a bus. About half of all school-aged pedestrians who were killed in bus-related accidents were between the ages of 5- and 7-years-old. Drivers are asked to be cautious when driving near school buses. As buses drop off children for winter break, motorists are asked to be cautious for young pedestrians all around the state and not just near bus stops. If you or your child has been injured in a pedestrian-car in the Massachusetts, contact Boston Personal Injury Lawyer Attorney Jeffrey S. Glassman for a free and confidential appointment to discuss your rights. Call 1-877-617-5333.